The secret to this recipe is in the jam- and I mean the jam in the dough. Yup, there’s jam in the dough- just a tablespoon, but it makes all the difference-you get soft, melt in your mouth dough. And what about the filling? This is where I go for the easiest solution and use store-bought spreads, and there is no shortage of good quality spreads today such as Nutella, dolce de leche, date spread, peanut butter, good old regular jam and many more. You choose! 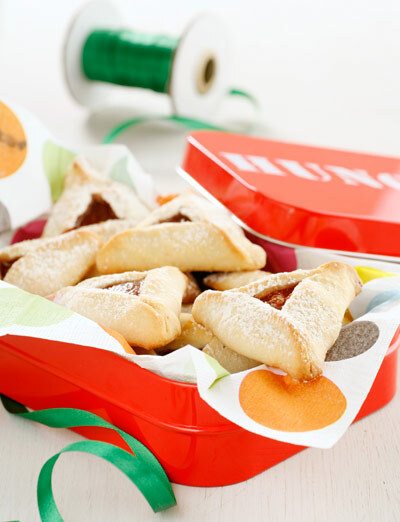 One tip before you start rolling out the dough- using a cookie-cutter- cut out many circles out of the dough-the best hamantachens are the ones whose dough is really thin, but not too thin, and the filling is generous, but not too much (as in life, proportions are key). Stick to the recipe and you won’t be sorry! Using a mixer fitted with a paddle attachment, mix together all the ingredients for the dough until the mixture is smooth. If the dough is sticky, add a bit of flour. Wrap the dough in plastic wrap and refrigerate for one hour. Working on a well floured surface, roll out the dough to about ⅛ in. thick and cut circles out of the dough (using a 3 inch round cookie cutter). 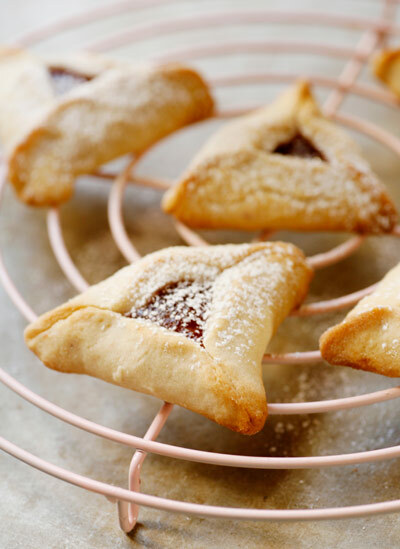 Place a teaspoon of filling on each circle, make a triangle shape with the dough, make sure the edges are pinched tightly together (otherwise they will open during baking) and place on the lined baking sheet. Bake for 15-20 minutes, until the golden. Remove from oven and let chill to room temperature. Decorate with powdered sugar. Replace two tablespoons of flour with two tablespoons of cocoa powder and you’ll get chocolate humantachens. Add a half a teaspoon of cinnamon to the dough. Add the zest of a half an orange to the dough. Beautiful little hats! I love the jam in the dough tip, but is that a typo in the recipe where it calls for a cup? you are absolutly right! it was a typo, the right amount is one spoon. Just made these today and they’re wonderful! Delicious and buttery and stayed together in the oven (aside from a rebellious one or two). Great recipe.